On 23 March 2018 Ms. Louise Friis-Hansen from FIG and Jess Svendsen, Head of Department of the Danish Geodata Agency and Pia Åbo Østergaard met a deligation from Henan Provincial Department of Land and Resources, Henan CHINA in the FIG office. Yu Jiyun - Land Chief Inspector/ Senior Engineer, Henan Provincial Department of Land and Resources, Chen Xinzhong - Director of Science and Technology Department, Henan Provincial Department of Land and Resources, Pei Jintang - Director, Henan Land and Resources Electronic Affairs Center, Zhang Wenxiu - Deputy Director, Nanyang Municipal Bureau of land and resources of Henan Province and Liu Linbo - Director, Xuchang Municipal Bureau of land and resources of Henan Province attended the meeting. During this visit director Ms. Louise Friis-Hansen gave a presentation on FIG and the activities of FIG as a global Federation as well as explain about some of the contributions of FIG. Jess Svendsen and Pia Åbo Østergaard, both from the Danish Geodata Agency, gave a presentation about the work in the areas of surveying geomatics, geodesy and geo-information community and how it is handled in Denmark. The following discussion between the Danish Geodata Agency and the delegation from Henan Province was especially concentrated about Remote Sensing, the use of UAV’s, and the digitalization of cadastral data and its challenges. 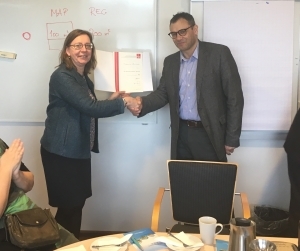 After the presentations and exchange of information, Ms. Louise Friis-Hansen handed over the membership certificate to Jess Svendsen on behalf of the Danish Geodata Agency who became afffiliate member of FIG.